CAMPLE LINE is pleased to present New Town New Wave, a compelling new work by filmmaker and sound artist Mark Lyken, developed following the Namwon Sound Art Residency that he undertook in November 2017 at the former KBS (Korean Broadcast System) building in Namwon, South Korea. It will be installed alongside Namwon Broadcasts, 2017, a new 20 minute soundwork recorded during an improvised performance in the KBS basement machine room, comprising sounds and field recordings gathered in and around the building during the residency. In addition, we will screen Lyken’s recent film Táifēng and the Motorway Saint, 2017, itself the outcome of a residency in Taiwan and commissioned by Cryptic for Sonica 2017. 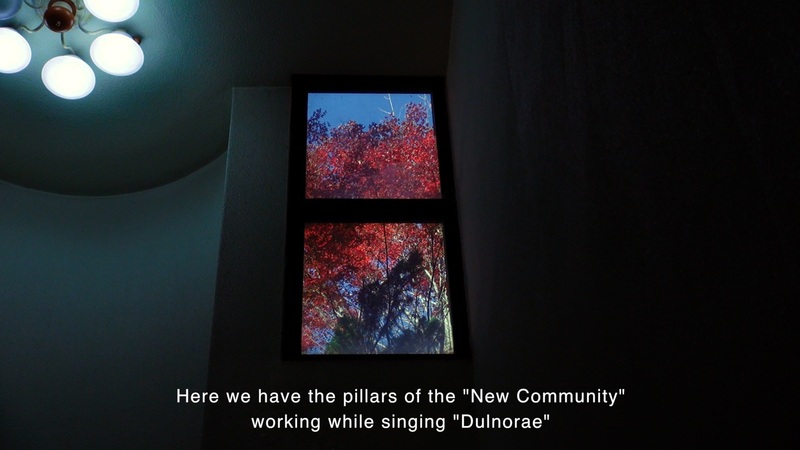 New Town New Wave includes a two-channel film installation and related three-part photographic work. The film installation comprises two screens, each showing a fixed camera shot of 20 minutes duration. The first shot frames a high window situated on the stairs leading up from the basement level of the KBS building and through which a Korean Maple sways in the wind. In the second shot, afternoon light tracks across the foyer leading through to the empty KBS theatre. Although the ambient sounds of the building can be heard, the primary sound track comprises a reel-to-reel KBS archive transmission called New Town New Wave (The Deullorae of Imsil), which was originally aired at 10:45pm on August 23rd, 1976. The broadcast introduces a Nongyo or Deullorae (Farmers’ Song) called Imsil Dulnorae from the village of Duwol-ri in the county of Imsil-gun. The related photographic work shows the open reel tape itself – the only archival example of a KBS broadcast to be located in the building during Lyken’s residency. Táifēng and the Motorway Saint is a 60-minute film that resulted from a month-long residency Lyken undertook at Taipei Artist Village. Filming in the middle of táifēng (typhoon) season, Lyken managed to shoot the footage over 21 consecutive days across in Taipei, Kaohsiung & Tainan, all on public transport, on foot, or on the back of a scooter. Combining Lyken’s interest in observational filming techniques and the ways in which micro-narratives of life and place unfold in time, Táifēng is a visually rich meditation on texture – both random and ordered – of contemporary Taiwanese life. A new short text by Dr Philippa Lovatt, Lecturer in Film Studies at the University of St Andrews, will accompany the screening ofTáifēng and the Motorway Saint. Mark Lyken is currently based in Dumfries and Galloway in South West Scotland. He is a filmmaker and sound artist. He creates observational film, musical and sound works, performances and installations that explore relationships to place and the interplay between nature and culture. This has led to collaborations with artists and scientists, most notably with the University of Aberdeen’s School of Biological Sciences. Lyken’s work has been presented in Brazil, India, Italy, Mexico, Poland, Romania, Sweden, Taiwan and widely across the UK.